Like many of you, here at Zim’s we love going outside in the beautiful Spring weather this time of the year has to offer. After all, we’ve made it through Winter and now it is time to enjoy fresh air and the world all abloom! One of the best ways to appreciate the glories of Spring is by getting our hands deep into the soil working in our personal or community gardens. Not only do we get delicious food from this practice but we also get to feel the satisfaction of seeing plants grow from a seed to a plant ready to pick. Unfortunately, all these positives can be outweighed by the strain gardening can put on our bodies. Fortunately there are common-sense steps we can put in place to help reduce our risk and make our experience gardening pain free. 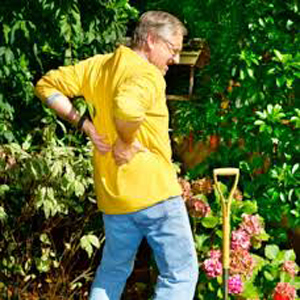 The biggest culprit for becoming injured while gardening is in our back. The bending over that happens while pulling weeds or preparing the ground for plants can be hard on our backs and knees. To try and avoid this type of injury make sure you invest in ergonomic gardening tools that are designed to reduce stress on the back. Also take breaks to stretch and move all your muscles around so that your body is more flexible and less likely to be injured. Pulled and torn muscles be can another problem when we are participating in any athletic event or intense activity for many hours. One helpful tip in avoiding these injuries is to do a variety of tasks using different muscle groups. If your arms are getting tired of pruning a tree or bush than take a break and water the flowers for a bit. There are always multiple tasks to be done in a garden, so shake things up and your body will thank you! Finally make sure to stay fully hydrated and avoid working in the heat of the day. Even in the Spring or Fall the sun can be draining on the body and can put us at risk of heat exhaustion or more. Making sure we have enough water can be easy to skip especially in humid weather where sometimes we get a false sense of hydration. This is very important because dehydration can contribute to muscle pain and fatigue making our entire experience unpleasant and even dangerous. If you do get some aches and pains from gardening try our Zim’s™ Max-Freeze cooling gel. It offers long lasting cooling relief and will help you recover so you are ready to take on the next big activity in your life!